A brand new silhouette from Adidas and Pharrell will be introduced this weekend at the Three Stripes’ 747 Warehouse event. Launching in an eye-catching colorway, this silhouette will be the first collaborative Crazy BYW sneaker for Adidas. Working for the first time on an Adidas Basketball sneaker, Pharrell lends his design aesthetic to this newly released shoe form the brand. 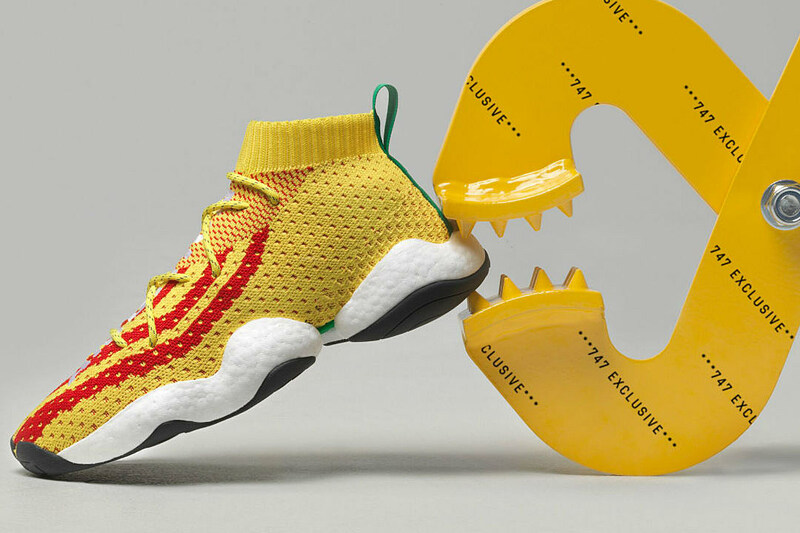 Powered by the technology of the Crazy BYW, the sneaker features Boost technology with the new popular construction to provide a new level of comfort. The silhouette also features Adidas’ signature prime knitted upper with a blend of soft fabrics in striking bright yellow and red colorways. In addition, the sneaker features the word “Ambition” embroidered on the vamp of each shoe in bold white letters. Inspired by the city of Los Angeles and its famous fruit stands, the silhouette embodies the lifestyle of the City of Angels. This Crazy BYW PW is a limited edition style exclusively available to a small group of people chosen by Pharrell and will not be available for purchase on a larger scale. However, attendees who visit the 747 warehouse event by Adidas in Los Angeles will be eligible to win this limited edition silhouette.